On February 13th 2018, Ambassador JIN Zhijian presented to His Excellency Guðni Th. Jóhannesson, President of the Republic of Iceland, the credentials accrediting him as the new Chinese Ambassador to Iceland at the President’s Residence at Bessataðir. Later during their cordial and friendly talks, Ambassador JIN Zhijian conveyed the sincere greetings of the Chinese President XI Jinping to President Jóhannesson and highly commented the fast development of China-Iceland relationship and the great contribution President Jóhannesson has made to it. He said he looks forward to working together with friends from all sectors of society in Iceland to push forward the practical cooperation between China and Iceland in all fields. President Jóhannesson asked Ambassador JIN Zhijian to convey his best wishes to President XI and welcomed him back to Iceland after decades as the new Chinese Ambassador. He said that he is pleased to witness the sound development of Iceland-China relations and is willing to continue the good cooperation with Ambassador JIN Zhijian as well as the Chinese Embassy to jointly push forward the bilateral relations. President Jóhannesson then held a reception for Ambassador JIN, with participation of more than 80 guests from all walks of life in Iceland, including Secretary General of the Office of the President Mr. Örnólfur Thorsson, Permanent Secretary of the Ministry for Foreign Affairs Mr. Sturla Sigurjónsson, representatives of the Chinese community and exchange students in Iceland. 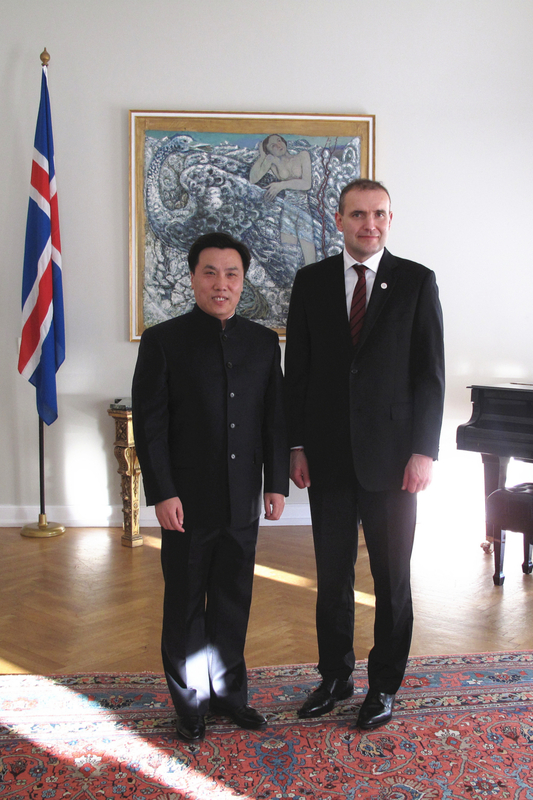 Ambassador JIN Zhijian arrived in Iceland on January 29 to take his office. He presented the copy of his credentials to Mr. Hannes Heimisson, Chief of Protocol of the Ministy for Foreign Affairs of Iceland on February 12.